Sitting at the rooftop Luna Bar at sunset, you are treated to a vision of dusky rays reflecting off the iconic Parroquia de San Miguel Arcángel church, casting soft rose tones on the Spanish colonial buildings and the cobblestone streets below. 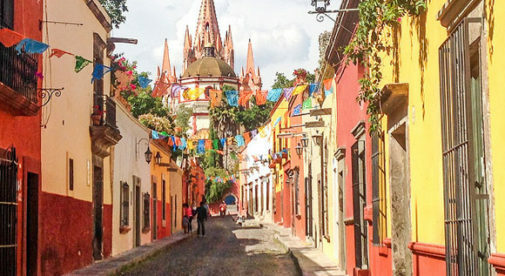 This is but one of the scenes that’s enchanted more than 10,000 expats, enticing them to make the Mexican highland city of San Miguel de Allende their home. On a recent visit, my husband and I wandered through steep, narrow cobblestone streets, peering into hidden courtyards filled with babbling fountains, creeping vines, vividly colored flowers, and inspiring art. Without fail the peal of church bells would direct us towards the main square of El Jardin and the church, the focal point of this lively city. These walks took me back to happy days spent meandering the hill towns of southern France and Spain. But San Miguel is deeply rooted in the heartland of Mexico, a few hours’ drive from Mexico City. Its altitude is over 6,000 feet, so the days are comfortably warm…the nights blissfully cool. Since the 1940s San Miguel’s been a magnet for savvy artists who appreciate natural beauty and an artistic community. Soon after the expats followed. People who have never visited often tell me that the cost of living in San Miguel is out of reach. But with the dollar’s strength against the peso right now this is an affordable place to live. Expats I met told me they spend less than $2,000 a month (including rent) to live in San Miguel. San Miguel has a reputation for pricey rents and real estate. But when I took a look for myself I was pleasantly surprised. My good friend found a lovely one-bedroom apartment in the desirable Centro area for $750 a month. I walked through several two- and three-bedroom houses in good neighborhoods. The first house I viewed rents for $850 a month, but was at the top of a steep hill. The second was a lovely three-bedroom, two-bathroom home in a safe, up-and-coming neighborhood. It rents for $1,250 a month. These prices are for long-term rentals. The cost to buy a desirable home in the popular Centro area can be steep. A beautiful two-bedroom, one-bathroom home in the heart of town is currently selling for $350,000. But it also has two additional one-bedroom casitas that could be used to generate some rental income. Take a short walk from the center of town and prices drop quickly. If you were to purchase a home on the edge of town, the price for a two- to three-bedroom home is quite reasonable. Casa Diana is a two-bedroom, two-bathroom home in the popular San Antonio barrio. A 15-minute walk from the center it’s priced at $185,000 and is located on a picturesque street with vine-covered walls. A little farther from the Centro is a colorful five-bedroom property with a number of living areas, a roof-top terrace, and outdoor patio areas. It would make a great large home or could be run as a B&B, as it has been in the past. It comes fully furnished with an asking price of $199,000. If you do decide to rent or buy in San Miguel, it’s a place where you’ll never be bored. This city of beauty and culture offers a dizzying array of activities. Any expat with a penchant for the arts, culture, and healthy living will find it easy to stay busy. Live concerts are held often, you’ll find live theater, an opera, and movie theaters. You can dance salsa one night and tango the next. Zumba aerobics and tai chi classes are held in the parks and yoga is taught at many places. A variety of Spanish-language programs are also offered. Expats come to the Saturday market each week to hang out, buy fresh produce, and join friends for lunch. It’s quite a scene, with live music and a mix of lunch options. I opted for several local tacos, at $2 for three. I was directed to pick three different fillings from the 20 on offer that day. They were delicious and, much like everything in San Miguel these days, it’s hard to beat the price. Paula has been in love with San Miguel, an artsy town in Mexico’s Colonial Highlands, ever since she first visited in 2012. The town’s vibrant arts scene, colonial architecture, and temperate climate kept her coming back for years before she moved down permanently last year.